Reading two comic books within two months makes me look like far less of the sleek, hip-hop player most people see me as these days and far more of the friendless, bullied nerd I was treated as for most of my childhood/youth/young adulthood*. But the first is true, yo, I’m A Rapper. (Click fo’ the evidence.) I’m a rapper who, when ill yesterday, INDULGED MYSELF by reading a book aimed at teenagers. I have previously read the first Walking Dead compendium (and seen the first series of the TV show, but I much prefer paper to screen so haven’t made it any further through yet), and this second one comprises issues 49-96, which is four years’ worth of monthly comics. 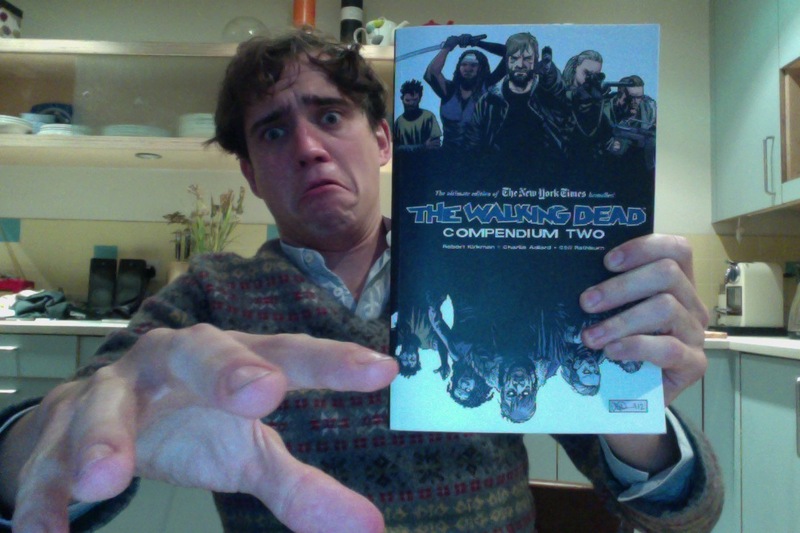 I like zombie films, and I like The Walking Dead, because I like desperation in literature. I like desperation and decay, bodily and moral. And throughout this huge volume of comics, there is a lot of both. After all of the kerfuffle with the Governor in the first compendium, the survivors the reader is familiar with are all incredibly suspicious of other people – justifiably, I suppose. In their post-apocalyptic world, everyone is desperate, everyone is brutal, everyone is violent. In this second collection there are cannibals, child psychopaths, protection racketeers… leading Rick, the ex-police officer and ultimate protagonist of the stories, to the big epiphany that it isn’t the dead who threaten safety any more – it is other people. “The dead are a manageable threat”, he says, showing the central characters finally becoming aware of what the readers were from pretty early on in this long running serial. The visceral, bloody, detailed, drawing style, lots of people, lots of faces, lots of personality, makes the book a pleasure to look at. The violence is sudden, the landscapes beautiful, every character recognisable, which is always important with comic books. I will certainly read more. And will probably try to catch up with the TV show. A great comic. *When, ironically, I never actually used to read comic books at all.